Comm Eye Health Vol. 30 No. 98 2017 pp 37-38. Published online 07 September 2017. Centre for Brain and Cognitive Sciences, Peking University; Beijing Tongren Hospital, Beijing Capitol University, Beijing, China. Orbis International, New York, USA. Orbis International, New York, USA; Translational Research for Equitable Eyecare, Centre for Public Health, Queen’s University Belfast, Belfast, Northern Ireland; Zhongshan Ophthalmic Centre, Sun Yat-sen University, Guangzhou, China. Exciting solutions are being developed to combat the huge increase in childhood myopia that had become the leading cause of visual impairment, particularly in East Asia. In these settings school-based vision care programmes can make a real difference. Spectacles are crucial to achieving the United Nation’s Sustainable Development Goals on access to essential health care services and equitable, high-quality education 5 They provide an inexpensive, safe and effective means of addressing URE. Giving a child spectacles significantly improves educational outcomes,6 unlocking a lifetime of opportunities. Exciting developments have recently occurred in the prevention of myopia through increased time spent outdoors10, multi- or dual-focal lenses, overnight hard contact lenses (Ortho-K), and use of very low concentration atropine eye drops. It appears that an additional 40 minutes per day spent outdoors can reduce new cases of myopia by a quarter,10 and some studies suggest that more time outdoors might lead to even greater reductions, perhaps as much as a 50% decrease. In some countries, such as China, where myopia rates are very high, pressures for children to study more have made it difficult to increase the time spent outdoors. However, a full-scale, island-wide programme in Taiwan called ‘Daily 120’ has added two hours (120 minutes) of outdoor time to every school day for all children, and there are indications that myopia rates may be falling as a consequence. Increased outdoor time for children can also reduce the risk of diabetes and childhood obesity, two growing problems in children worldwide, and may also be helpful in combating vitamin D deficiency. Regarding atropine, higher concentrations can cause blurred vision for reading and discomfort in bright lights due to dilatation of the pupils. However, recent studies in Singapore 11 suggest that using very low concentrations (0.01%) offer several advantages: this dose has nearly as strong an effect in slowing myopia progression as higher concentrations, does not affect near vision, causes no problems with discomfort from bright lights, and – most importantly – does not appear to have a strong ‘rebound’ effect (an increase in myopia after cessation of the drops). Due to this latter reason, the overall effect of 0.01% atropine in reducing myopia may actually be greater than that of higher concentrations. Vision testing by a teacher in a rural classroom. CHINA © REAP, Qingming, China. Until these strategies are ready for wider use, schools provide an appealing location for carrying out traditional vision screening for children. As attendance rates continue to climb throughout the world, schools offer a convenient setting where the majority of children in a community may be found and regular follow-up can be provided, often with the assistance of teachers who are familiar with children’s needs. Children attending school are more likely to develop myopia requiring the use of spectacles, and the educational benefits of spectacle wear are most likely to be realised if teachers help to support their use in school. Treatment for the full range of vision problems affecting children in a particular setting can be arranged by collaborating with nearby vision care facilities. 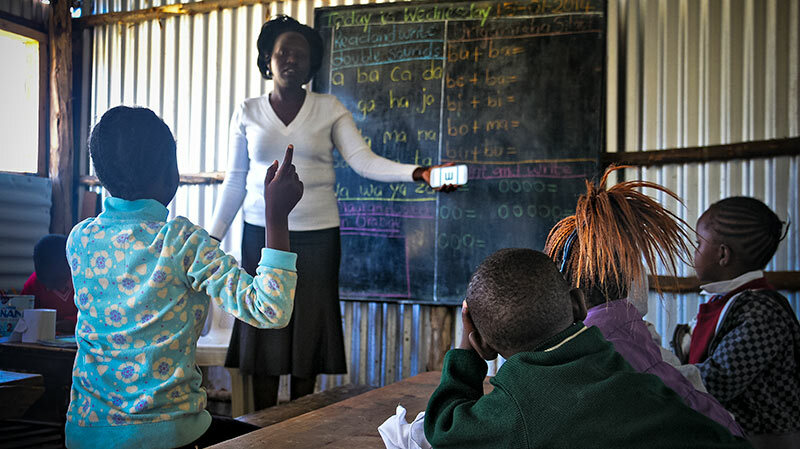 School-based vision care programmes work best in settings with a larger burden of refractive error, a greater proportion of children attending school, a higher population density and better transport infrastructure. Below are two examples. The Rural Education Action Programme (REAP)’s Seeing for Learning social enterprise programme is a successful collaboration between the private and public sectors. It provides vision screening services and spectacles to children living in rural areas in China. 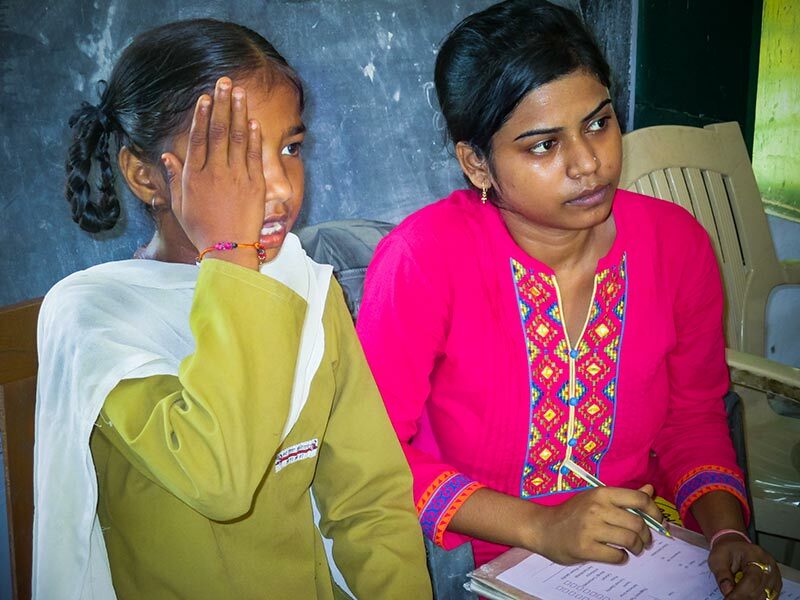 Teachers are trained to provide initial vision screening of students, and children who need additional care are referred to affiliated vision centres at nearby hospitals. After additional examinations and refraction by a medical professional at the vision centre, rural school children receive their first pair of spectacles free. The vision centre is able to access a new consumer market, children receive the services and spectacles they need, schools see improved test scores and the county government is credited with addressing a public health concern. Orbis’ new REACH (Refractive Error Among Children) programme is working with local partners to address the problem of URE among three million schooling children in fifteen districts across India. REACH Guidelines help standardise the screening process for all partners. The programme includes the use of LED pocket screeners, hand-held auto refractors and REACHSoft, a comprehensive software solution developed to capture data for planning,implementation, and monitoring of field activities in real time. The data generated are analysed and used to better understand local service delivery challenges, thereby aiding future programmes. These and many more school vision programmes around the world bring health care and education providers together to improve children’s vision in the setting where it matters most: the schools in which they must see to learn. 1 Resnikoff S, Pascolini D, Mariotti SP, Pokharel GP. Global magnitude of visual impairment caused by uncorrected refractive errors in 2004. Bull World Health Organ 2008;86(1):63-70. 2 Ellwein LB. Case finding for refractive errors: Assessment of refractive error and visual impairment in children. Community Eye Health 2002;15(43):37. 3 Sun HP, Li A, Xu Y, Pan CW. Secular trends of reduced visual acuity from 1985 to 2010 and disease burden projection for 2020 and 2030 among primary and secondary school students in china. JAMA Ophthalmic 2015;133(3):262-8. 4 Morgan IG, Ohno-Matsui K, Saw SM. Myopia. The Lancet 2012;379(9827):1739-48. 6 Ma X, Zhou Z, Yi H, Pang X, Shi Y, Chen Q, et al. Effect of providing free glasses on children’s educational outcomes in China: cluster randomized controlled trial. BMJ 2014 23;349:g5740. 7 Wang X, Yi H, Lu L, Zhang L, Ma X, Jin L, et al. Population prevalence of need for spectacles and spectacle ownership among urban migrant children in Eastern China. JAMA Ophthalmol 2015;133(12):1399-406. 8 Ma X, Congdon N, Yi H, Zhou Z, Pang X, Meltzer ME, et al. Safety of spectacles for children’s vision: a cluster-randomized controlled trial. Am J Ophthalmol 2015;160(5):897-904. 9 Zhou Z, Zeng J, Ma X, Pang X, Yi H, Chen Q, et al. 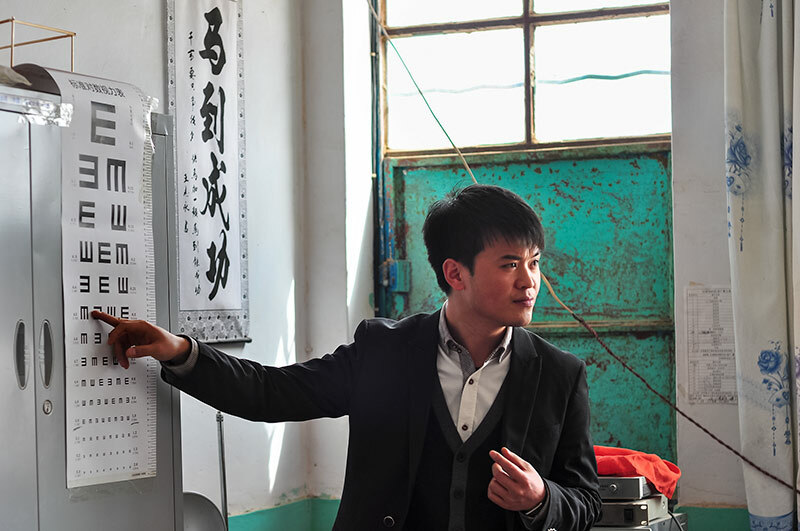 Accuracy of rural refractionists in western China. Invest Ophthalmol Vis Sci 2014;55(1):154-61. 10 He M, Xiang F, Zeng Y, Mai J, Chen Q, Zhang J, et al. Effect of time spent outdoors at school on the development of myopia among children in China: a randomized clinical trial. JAMA 2015;314(11):1142-8.